Look at that cover. Just...look at it. Hopefully in a few years, "Ring Of The Musketeers" will become a cult classic. It has everything you want: David Hasselhoff "acting" and "singing", Cheech Marin being a Mexican stereotype, and lots more! John Smith D'Artagnan played by The Hoff, is a musketeer. 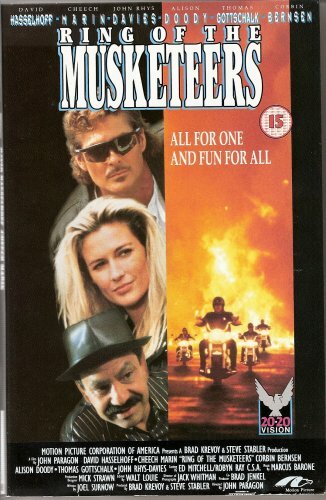 Smith and his two other musketeers fight crime for a living. Smith seeks out the missing fourth musketeer, who is played by Cheech. The whole movie is fun. Cheech tells jokes, and The Hoff doesn't laugh. It's great. Hasselhoff thinks he's doing Shakespeare with this film. Watch it tonight Or buy it! I did!